First, what an herbarium is not. It is neither a garden nor a greenhouse full of herbs. 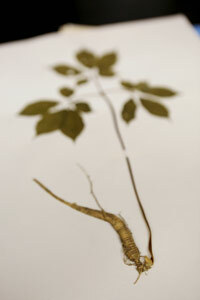 If you find basil or lemongrass in William & Mary’s Herbarium, it could very well date back to the 1940s. Herbariums are simply natural history collections of dried plant specimens with annotated details about who found it when and where. For centuries they’ve been used by botanists to provide information about species found in different geographic locations. They document variations in plant form, helping researchers identify species and document changes in their populations, according to the W&M Herbarium website. Increasingly, they’ve been useful for genetic botanists tracking species variation over time and space. Locally, W&M’s collection has informed the work of the Virginia Department of Conservation’s Natural Heritage Division, the Digital Atlas of the Virginia Flora and the massive Flora of Virginia. The W&M Herbarium was formally organized in 1969 with a focus on the southeast United States and Virginia’s coastal plain, though some specimens predate the herbarium and others hail from wherever W&M researchers have roamed. The operative question now is how herbaria will be used in the 21st century and beyond. All natural history collections, including herbaria, may have peaked in the 19th century, but new digital collections and communications are expanding their accessibility and value to botanists and climate scientists. The W&M Herbarium is part of a massive global effort to digitize these collections, some of which date back hundreds of years. The first step is getting the specimen information out of the banks of herbaria cabinets and networked. Already, WILLI – as the W&M Herbarium is called – has digitized more than half of its roughly 81,000 specimens, Curator Beth Chambers said. At first, Chambers considered keeping the data local to William & Mary, but ultimately decided to join the Southeast Regional Network of Expertise in Collections – or SERNEC – portal so that researchers could find WILLI’s specimens easily in regional and national searches. The digitizing effort was greatly helped by herbarium volunteer Maureen Tracy; John Drummond, academic engineering and e-learning manager; and the W&M Unix team, including W&M Systems Engineer Phil Fenstermacher and Unix Systems Engineer Roger Clark. All helped streamline the massive uploading project, Chambers said. She believes every record generated by WILLI since 2000 is now publicly available for free through SERNEC, including new collections the herbarium acquires. WILLI recently accepted more than 1,000 plant samples from a student who surveyed the flora of the College Woods, all of which will be quickly uploaded to SERNEC. The “legacy data” – the older, paper-only specimens – will be digitized over time by assistants and volunteers, Chambers said. She and Swem Library will also be writing a grant proposal over the fall semester to obtain funding to digitize images of the plant specimens. WILLI has also been deliberate in its digitization. The herbarium refrains from submitting any location information for certain plant species. The system provides a way to cloak the information, but to be absolutely safe, WILLI omits the information entirely. Already Chambers is seeing how having the specimen data publicly available online conveniences researchers. She points to an email received in the past few days from a West Coast botanist planning a research trip targeting Celtis tenuifolia (Georgia or dwarf hackberry) and who found WILLI’s records through SERNEC. In the past, the same researcher would have had to first know there was an herbarium at William & Mary and then call, email or write to ask if WILLI had a specimen. Even people in the same building have benefited from the digitized data. Students of Biology Professor Harmony Dalgleish’s Fire Ecology class recently worked on a class project showing how Western pines withstand periodic fires. A student found online that WILLI had specimens from out West collected by Biology Professor Martha Case and borrowed them to exhibit to the class. Chambers is particularly excited about the future capabilities of the digitization project. Using GPS technology, botanists are able to pinpoint with great accuracy where a specimen was collected. Submitted to SERNEC, the information allows researchers to better map the ranges and ecological conditions of different plant species. Some of the legacy data doesn’t translate well for mapping, though. Chambers noted one botanist collecting in the late 1940s notorious for his imprecise location notes. One of her students, Erin Chapman ’17, was awarded a $5,020 Green Fee Project grant this summer to start filling in some of the gaps in the historical record, specifically looking at invasive plant species in Virginia’s coastal plain. Chapman will first find areas where the invasive species have not been mapped but are suspected to be. Then she’ll check digital and physical herbarium specimens to see if there’s a record that hasn’t been logged with the Digital Atlas of the Virginia Flora but would put the invasive plant in the locality. If she finds no record, Chapman will go look for it in the field. Chambers said another benefit of digitized herbarium records is their ability to include or link off to more geographic, taxonomic or historical information than the physical herbarium specimen can convey. She pulled out a herbarium specimen to illustrate. Botanists have waged an ongoing battle for decades about whether the varietal Trillium pusillum var. virginianum (Virginia least trillium) was truly a variety or whether it should be taxonomically classified as simply Trillium pusillum. Sometime in the 1940s or 1950s, W&M Professor John T. Baldwin Jr., who specialized in plant cytogenetics, did a study on the variety’s chromosomes. “And he posted a little note here that this is what the chromosomes look like,” Chambers said, pointing to a note pasted in the upper left corner of the specimen sheet.